Me Made May 2017 – a reflection | More blue fabric? The month in all it’s glory! So that’s it, another year of Me Made May bites the dust. There’s a roundup post of everything I wore here, but I also wanted to write something about the wider experience of this year’s challenge. This year I set myself the goal of wearing a me made item every day (as I did last year), but with the added requirement of not having any repeats. This was partly out of a want to rediscover favourite clothes that may have fallen by the wayside, but also out of a desire to figure out just what it is that I have yet don’t wear, even when the regular repetitions in my wardrobe and negated. I don’t need to make new clothes all the time. Last year, I had a load of new items that I made during the month as I felt a pressure to show something new / different every day. I can do that with what I have. As such the makes this month were a dress I already had planned, a dress that bordered on a costume, and two items I’m not planning on wearing until June. I like taking photos of my outfits, but I hate the pressure I felt to do something unique every day, even though that pressure was solely created by me. That said, I still embraced my ridiculous side as much as I could. There’s a reason some items don’t get worn. It’s because they’re occasion wear (hello Christmas dress), and that’s okay. There’s a reason some items don’t get worn. It’s because they don’t fit very well, or the style isn’t really something that I feel comfortable wearing. That’s not quite so okay, and I should just get rid of them. My body image is pretty rough at the moment. I have had some very gradual weight gain over the last year; not enough that someone would necessarily notice to look at me, but I notice, and the tape measure has started to notice it too. This is not a great feeling. It’s a worse feeling on days when the weight gain in my head feels like I’ve turned into some ungainly lumbering monster, bulging all over the place. Who then has to take a photo of herself. In clothes that she is convinced won’t fit her so doesn’t want to even countenance trying on. Like I say, my body image is rough. HOWEVER, do you know what I’ve actually learnt? Those clothes that I’m sure won’t fit? They do. They all do up. Every single one of them. Sure, there’s one dress which feels a bit tighter than it did last summer, but it felt tight then, so it’s not that much of a surprise. Which is a bit of a ramble, but can be summarised as: my body image has been really out of sorts over the last few months, but forcing myself to wear clothes that aren’t repeats and taking photos of the clothes I’m wearing has made me realise that it’s pretty much all in my head. Which doesn’t fix it, but it does help. Which is a good step in the right direction. I think you look gorgeous in every single me-made outfit! 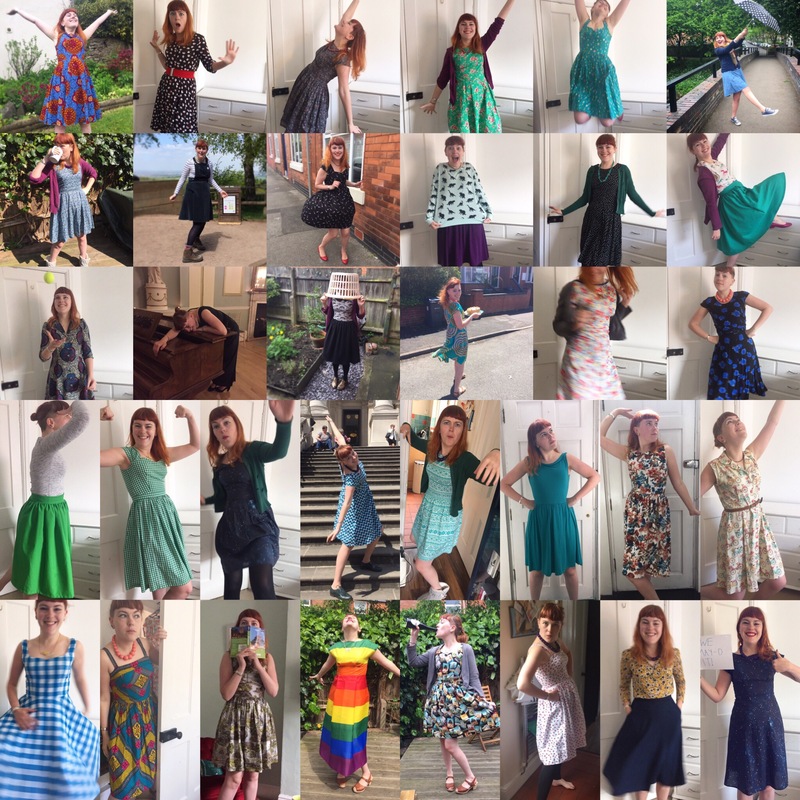 I’m glad that wearing lots of your me-made clothes has given yourself a bit of perspective to realise that you ARE bloody lovely no matter if there has been an extra cm gained in places! (I can not see where). What a great round-up and I look forward to seeing your new additions and what bites the dust. I have been so much more ruthless with my non-worn-me-made clothes its very liberating indeed!